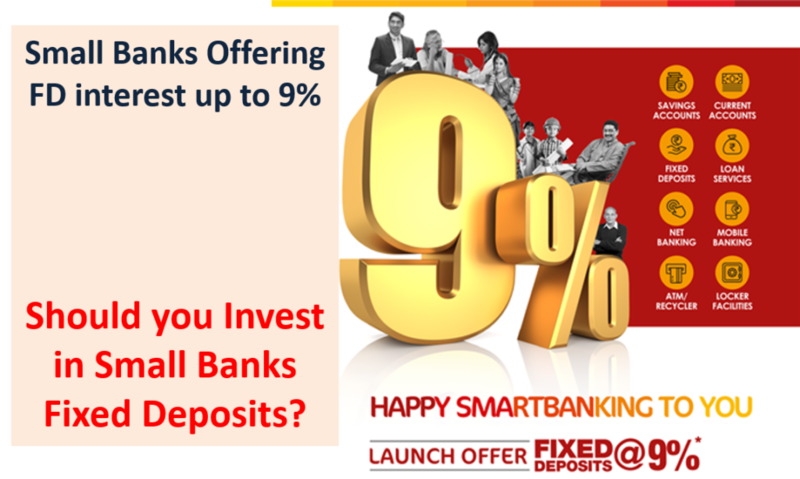 Should you Invest in Small Banks Fixed Deposits? RBI on September 2015 had granted licence to 10 Small Finance Banks. Lately these banks have been in news for offering higher interest rates on their fixed deposits as compared to regular banks. In this post we would tell you whats on offer by small banks and if you should invest and bank with them! Equitas Small Finance Bank offers additional 0.75% for Senior citizens. Jana Small Bank offers additional 0.60% for Senior citizens. All other small banks offer additional 0.5% to senior citizens. Should you bank with Small Banks? These are new age banks and some of them are putting technology to good use. Also as they are new, they need deposits to fund and expand their business of lending. To do so they have to offer higher interest rates. Some people worry about the safety of these banks .i.e. what if these banks close down? I do agree there is possibility that a shut down can happen but that is true for any bank which is operating today. I don’t think people should fear a shut-down as these are closely monitored by RBI. Deposits up to Rs 1 Lakh (including savings, fixed, current and recurring) is insured by Deposit Insurance and Credit Guarantee Corporation (DICGC) as in case of other banks. There are ways you can increase your insured deposit by smart moves. Also Read: How SWP in Debt Mutual Funds is better than FD for Regular Income? The small banks as the name suggests have local presence and they may not be present in your locality. The table below shows the bank headquarters. These banks are mainly concentrated in those geographies. In case you want to move to a different place, you may not be able to port your account to the new city as there may be no branches. But today most of banking is done by internet banking and hence may not be a problem for digital savvy customers. However, people who prefer branch banking may be in a fix in case you move too often. In case you have branch close to you and save money through fixed/recurring deposit, you must invest some part of your savings to these banks which are offering higher interest rates. Equitas Small Finance Bank interest rate is not matching, I checked online on website. Ujjivan Small Finance is a revolution in today’s banking with practically zero balance account, 9% interest on Fixed Deposit with zero penalty after 6 months and Mobile banking which is rated highest among all banks. Is there a plan for RBI to float dollar bond for NRI? Useless propaganda about Yesbank. Their interest rate is very low and like other Govt Banks.